Snow-covered peaks, steep rims and couloirs. The hustle and bustle of the skiing area fades away. The only thing you hear is the rustle of your skis on the snow. Breathtaking panoramas and the wilderness of the surrounding peaks reward you your long ascent over ledges and snowy slopes. The physical exertion during the climb and pure pleasure going back downhill, feeling your skis sink into finest powder, you leave the exertion of the ascent behind – that is the fascination of ski mountaineering. This combination of climbing and skiing, the freedom of using the complete mountain that entices more and more people to take a break from everyday life in the impressive mountain ranges of the world. This fascination inspired uvex engineers to develop the new uvex p.8000 tour, creating a helmet that can be used all over the mountain and meets each and every demand for ski mountaineering with ease. The uvex p.8000 tour is truly multitalented and is at home in several sports. The helmet in double inmould construction not only meets the ski (EN 1077 B) and climbing standard (EN 12492), but the bike helmet standard (EN 1078) as well. 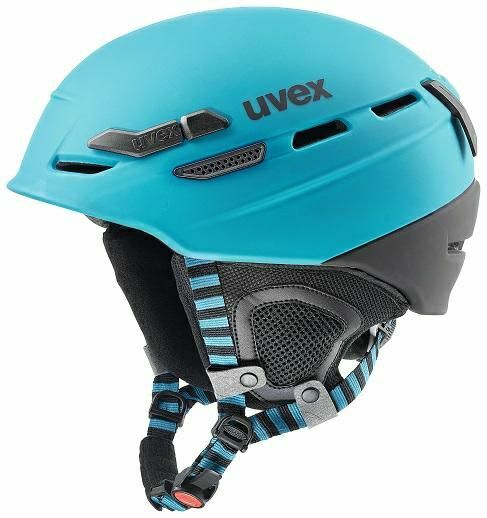 In winter, the uvex p.8000 tour seamlessly closes the gap between functional climbing and stylish ski helmet as an uncompromising ski touring helmet, in summer the allrounder weighing only 310 grams provides tried and tested protection on your bike. Function and performance are decisive in ski mountaineering. However, versatility is also important, and is another key feature of the uvex p.8000 tour: lining and earpads can be removed easily in just one step. This turns the comfortable ski helmet into a high-performance climbing helmet, whose ventilation system and breathable padding promise full comfort even during your ascent. In addition, the integrated BOA-system of the uvex p.8000 tour was exclusively adapted to the needs of ski mountaineering. Adapted from the biking sector, the fitting system is significantly lighter than in conventional ski helmets. The fit of the helmet can be adjusted easily even with gloves due to the enlarged wheel. More and more ski tourers follow the call to go outside in the evenings as well. Climbing the peak in the dark is a special challenge. For these cases, the uvex p.8000 comes equipped with an installation to hold a headlamp, along with the convenient goggle bracket. The integrated reflector of the RECCO-search system provides additional safety.